Just over 200 kilometers (120 miles) southwest of Barcelona, Spain’s largest river meets the Mediterranean Sea and creates the Ebro Delta. At 350 square kilometers (135 square miles), the delta is the fourth largest on the Mediterranean. It is an important wetland ecosystem and a productive agricultural area. Two large spits flank the delta to the north and south, giving it a distinct shape like a bird in flight. The Ebro River drains one-sixth of the Iberian Peninsula (more than 8.5 million hectares) as it makes its way from the Pyrenees and Cantabrian mountains of northern Spain. It winds through the regions of Cantabria, Castile and León, the Basque Country, La Rioja, Navarre, Aragon, and Catalonia, forming portions of those regional boundaries and lending its name to cities and towns throughout. As the Ebro traverses these regions of Spain, it takes pieces of each—sediments, soil, and sand. When the river meets the sea, it loses velocity and deposits its sediment load along the shore, feeding the delta. Scientists have estimated that the river first reached the Mediterranean Sea about 13 to 15 million years ago. The peculiar shape of the Ebro Delta reveals that it has had a rich morphologic history, and the delta has experienced tremendous shape-shifting recently. Motivated by the complex shoreline, a group of researchers led by Florida State University’s Jaap Nienhuis used simple models of river profiles and coastline evolution to understand the delta’s development. The authors established that rapid changes to the Ebro Delta began about 2100 years ago, and their results were published in Earth Surface Dynamics . “There is a lot of information hidden in that shape complexity that we knew might tell us something about what the delta looked like in the past," Nienhuis said. 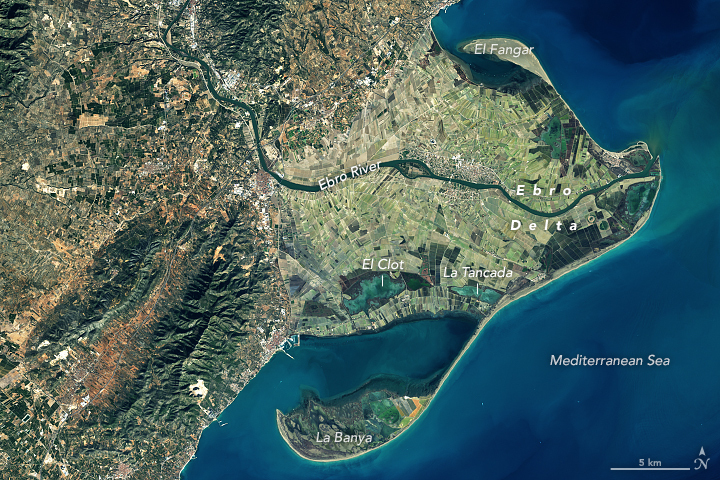 A substantial input of sediments built and shaped the Ebro Delta. Climatic records show that flooding was initially responsible for carrying an abundant amount of river sediments to the coast. But more recent delta growth spurts can be attributed to manmade land-use changes, such as forest clearing and the conversion of land to agricultural fields, which exposed more sediment for runoff into the Ebro River. Deltas are categorized into three main groups: river-dominated, tide-dominated, and wave-dominated. 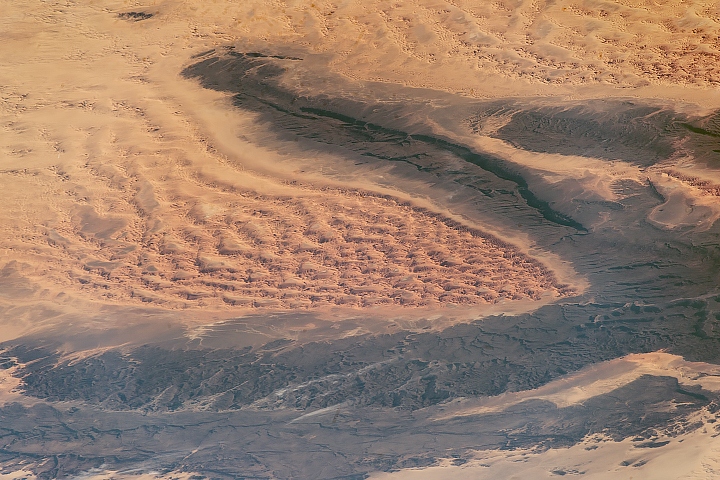 Wave-dominated deltas often have a “cuspate” shape, which is created as the sea pushes the river’s deposits back towards the shoreline on each side of the main channel. This leads to smooth, curving beaches that extend back to the mainland on both sides. River-dominated deltas are pointy because the river exerts itself into the sea, depositing enough sediment to sustain its river channel and outpacing the ability of waves to push those sediments back to shore. This creates “lobes” of land extending into the sea. More than 1,000 years ago, a river-dominated Ebro Delta formed a pointy lobe known as the Riet Vell. Then, around six centuries ago, the river channel changed course (a process called avulsion) and the Riet Vell lobe was abandoned. A new lobe called the Sol de Riu began to form at the mouth of the new river channel. Meanwhile, the abandoned Riet Vell lobe was slowly pushed landward by waves to form a spit at the southern end of the delta. Like a potter working a piece of clay, the constant wave action slowly transported sediments southwest, forming the long curving La Banya spit. An avulsion that occurred about 300 years ago moved the river channel yet again, this time abandoning the Sol de Riu lobe, which was in turn worked by waves into the El Fangar spit to the delta’s north. It also formed the Mitjorn-Buda lobe that the channel still runs through today. Nienhuis and colleagues speculate that sometime during this period of rapid delta growth, former unnamed spits closed off their protected bays and created the modern Encanyissada, Clot, and Tancada lagoons. 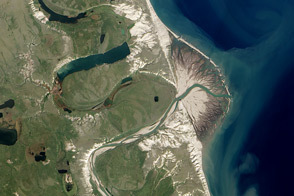 In this natural-color Landsat 8 image above, acquired on January 31, 2018, you can see the modern La Banya and El Fangar spits and the southern lagoons that were once bays, as well as the suspended sediment plume exiting the river’s mouth. Humans, who indirectly drove the growth of the delta over the past 2100 years, are today starving the delta. The waters of the Ebro River have been diverted for irrigation, so sediment dynamics have drastically shifted. There are now 187 dams on the river, and most sediments now settle in front of dams instead of reaching the sea. The loss of sediment deposits from the Ebro River means the modern Ebro Delta is now wave-dominated. River damming, combined with sea-level rise and land subsidence, are predicted to take their toll—40 percent of the delta could be submerged by 2100. NASA Earth Observatory image by Michael Taylor and Joshua Stevens, using Landsat data from the U.S. Geological Survey. Story by Laura Rocchio. Spain's Ebro Delta has recently experienced tremendous shape-shifting. 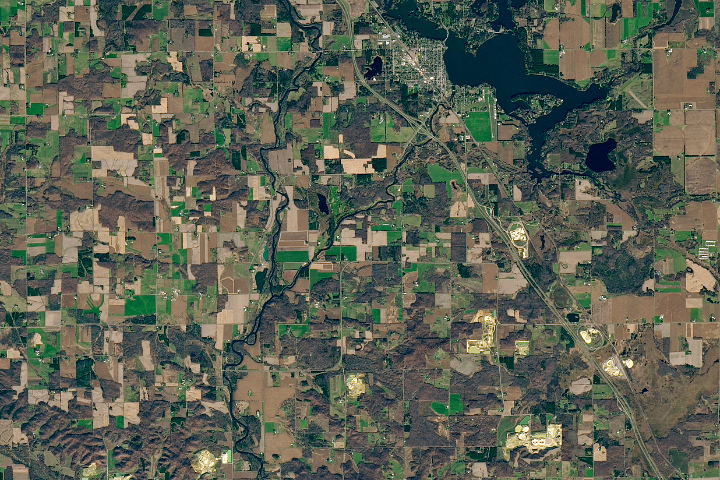 Google Earth Engine (2016) Delta from 1984–2016. Accessed March 12, 2018. Maldonado, A. (1975) Sedimentation, Stratigraphy, and Development of the Ebro Delta, Spain. Deltas: Models for Exploration , 311–338. Nienhuis, J.H. et al., (2017) Large-scale coastal and fluvial models constrain the late Holocene evolution of the Ebro Delta. Earth Surface Dynamics , 5 (3), 585–603.